Retired neurosurgeon-turned-Trump-Administration-housing-chief Ben Carson toured Baltimore’s Helping Up Mission today and had glowing praise for the Christian-oriented shelter and addiction recovery center. 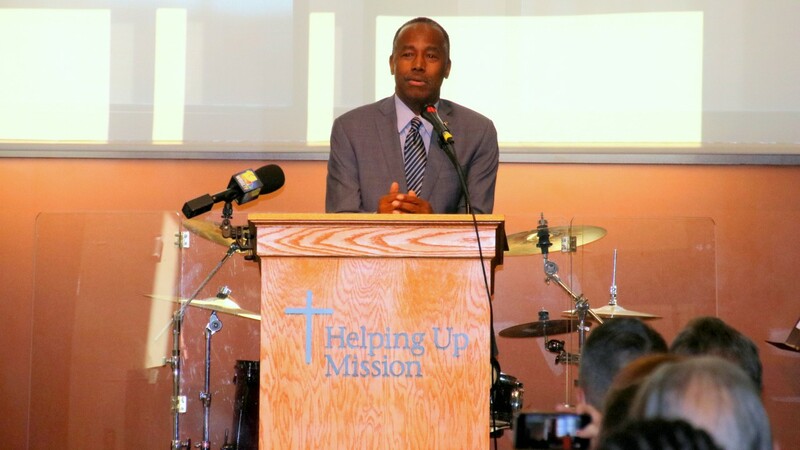 “It’s so wonderful that this is a faith-based organization because they understand that, but for the grace of God, we all could be here,” said Carson, secretary of Housing and Urban Development. At the East Baltimore home of the 132-year-old organization today, there was a men’s chorus singing religious songs, a hearty “Amen!” uttered by one participant in the round-table discussion and some gentle joshing about the group’s religious orientation from Carson himself. Carson’s visit coincided with the president’s recent declaration that the opioid crisis is a federal public health emergency. At the end of the speeches, the guests joined participants in the Mission’s programs in reciting the Serenity Prayer. It was the second official visit to Baltimore for the former Johns Hopkins Hospital physician since he became secretary. 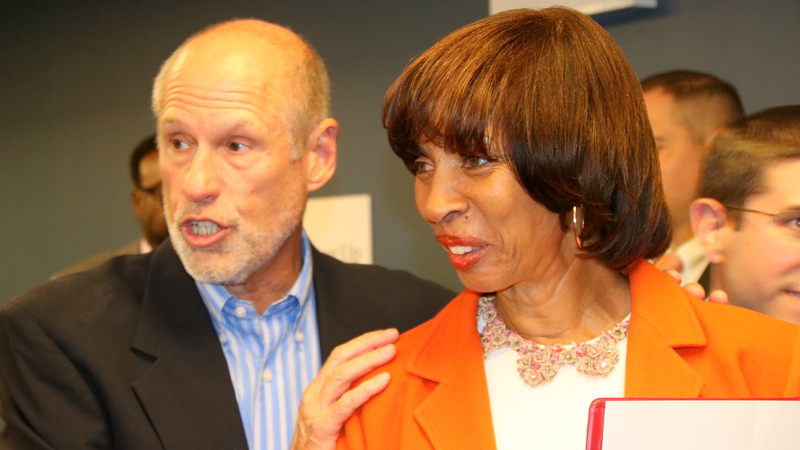 His appearance at the afternoon event also dovetailed with Mayor Catherine Pugh’s alliance recently with the Helping Up organization as she confronts the city’s homelessness problem. 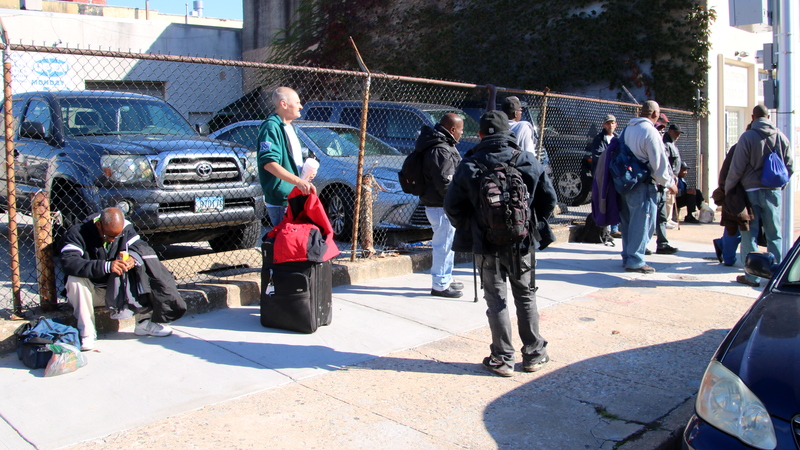 The Helping Up Mission, at 1029 East Baltimore Street, has been a key Pugh talking point whenever the subject of homelessness comes up lately. The organization provides 24-hour emergency shelter services to about 500 men a day who are dealing with poverty, addiction and homelessness. Among their offerings is a 300-bed “Spiritual Recovery Program” for men that offers a multi-stage, potentially one-year stay for substance abuse recovery. Helping Up plans to build a similar 300-bed, $35 million facility for women across Baltimore Street in a building just east of where a new Ronald McDonald House is rising. Although Pugh mentions that project frequently, administration officials say there are no current plans to support it with city money. Senior philanthropy officer Jim Longenecker said mostly private donations will be used, but cautioned that details on the new building are preliminary at this point. “We’re in a quiet period” with the fundraising, he said. The first priority is to hold a December ribbon-cutting for a new $2.6 million kitchen for the Mission. “HUD paid for half of that,” Robert K. Gehman, the executive director of Helping Up Mission, told the gathering. 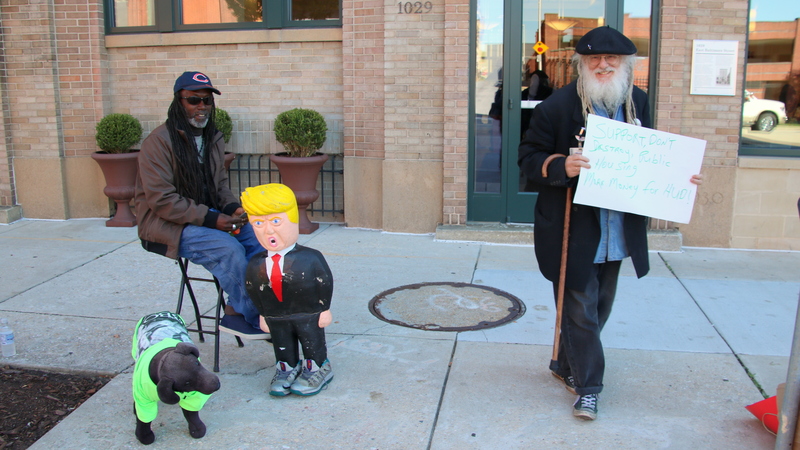 Outside the Mission, as visitors arrived for Carson’s appearance, protesters held up signs criticizing federal and local government actions on housing and health care. “Ineffective funded programs – from homelessness to substance abuse – r killing our streets,” said one of the signs. “Support, don’t destroy, public housing – more money for HUD,” said another held by housing advocate Jeff Singer, former president and CEO of Health Care for the Homeless. Federal public housing programs that could provide affordable shelter for low-income residents have been severely defunded in recent years, Singer said. In 1992, the city had the capacity for 17,000 public housing units, but it has since dwindled to under 10,000 units today. Carson has supported expanding a program to sell off public housing to private developers, which would deplete public housing in Baltimore further, Singer said. As for Trump’s speech sounding the alarm about America’s opioid crisis, Singer said it was empty rhetoric.